This is the third product I have tried from Amara Organics and one that I use with my morning skin care routine. As a teenager I had all of the time in the world to keep a skin care routine going strong but as I became a mother I was lucky if I did a full routine more then once a month. My Dr. has been telling me for years to take time for myself, that I had to stop burning the candles at two ends, and with my health deteriorating fast, I had to make changes to ensure I would be here for my children and grand children. I started with little things and even though taking care of my skin only really takes a few minutes, it has left me wondering why I cut that time out of my life in the first place. Months later I am well on my way to a full and regular routine and you know what? That little bit of time has been a big boost to my body and soul. Small changes make big differences once added together. Love my new skin care routine and love that Amara is helping me along one step at a time. 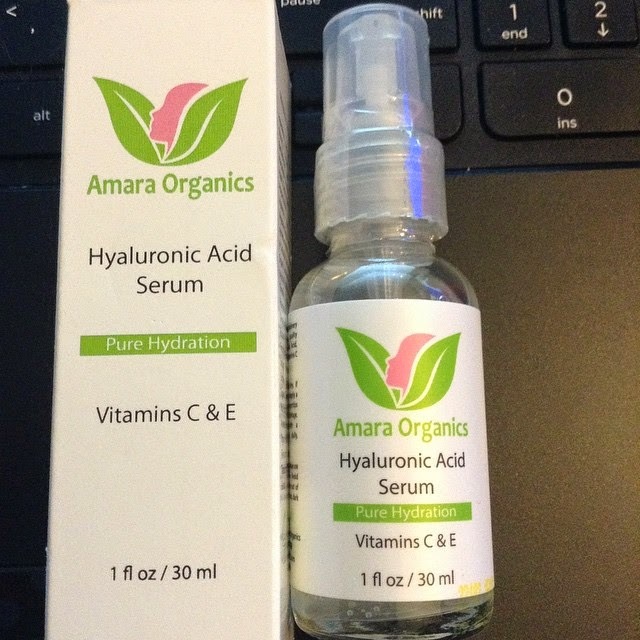 Amara Organics Hyaluronic Acid Serum sounds harsh but really it isn't harsh at all. This is a Certified Organic, Vegan, and Animal Cruelty free product and one I am glad to have added to my skin care routine. You can find Amara Organics Hyaluronic Acid Serum here.